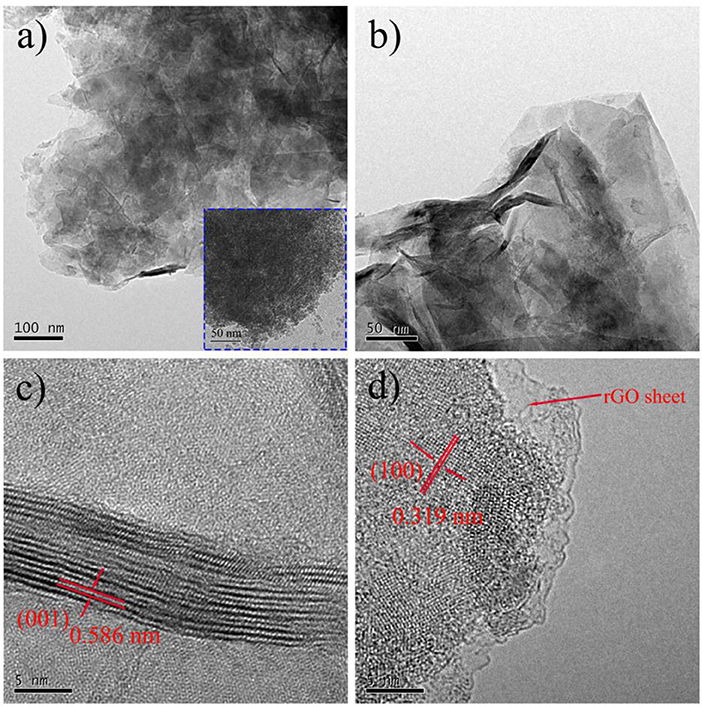 SnS2 nanosheets/reduced graphene oxide (rGO) composite was prepared by reflux condensation and hydrothermal methods. In this composite, SnS2 nanosheets in-situ grew on the surface of rGO nanosheets. The SnS2/rGO composite as anode material was investigated both in lithium ion battery (LIB) and sodium ion battery (SIB) systems. The capacity of SnS2/rGO electrode in LIB achieved 514 mAh g−1 at 1.2 A g−1 after 300 cycles. Moreover, the SnS2/rGO electrode in SIB delivered a discharge capacity of 645 mAh g−1 at 0.05 A g−1; after 100 cycles at 0.25 A g−1, the capacity retention still keep 81.2% relative to the capacity of the 6th cycle. Due to the introduction of rGO in the composite, the charge-transfer resistance became much smaller. Compared with SnS2/C electrode, SnS2/rGO electrode had higher discharge capacity and much better cycling performance. Lithium ion batteries (LIBs) are being widely used in the electric vehicles and energy storage fields (Wu et al., 2017; Chen et al., 2018b,c; Cui et al., 2018; Zhang et al., 2018; Zheng et al., 2018). However, the commercial graphite anode is far to meet the requirements of the high-performance LIBs due to its low theoretical capacity (Ryu et al., 2016; Li et al., 2017b; Yan et al., 2017; Wang et al., 2018). Furthermore, lithium resource is limited in nature. It is necessary to develop low cost and high storage performance sodium ion batteries (SIBs) to satisfy the energy demand (Li et al., 2017a; Zhu et al., 2017; Chen et al., 2018a). Sodium is rich on the earth, and possesses similar physical and chemical properties as lithium (Qu et al., 2014; Jiang et al., 2015; Wang et al., 2015b; Zhang et al., 2015a, 2017a; Fang et al., 2016; Xu et al., 2016c; Leng et al., 2017). However, the commercial graphite material is not suitable for SIBs (Qu et al., 2014; Fang et al., 2016; Xu et al., 2016c; Zhang et al., 2016a). Therefore, it is urgent to develop new anode materials with low cost and good electrochemical properties for SIBs. Currently, many researches have been carried out in transition metal oxides (Zhang et al., 2016b), metals (Lin et al., 2013) and carbonaceous materials (Xu et al., 2016a). These anode materials were used in both LIBs and SIBs, but suffer from the disadvantages of poor sodium storage, poor cycling property, etc. The layered structure materials, such as SnS2, have been considered as promising anode materials for SIBs (Chao et al., 2016), due to high theoretical capacity, electrochemical stability, low cost and environmental friendliness. SnS2 has a layered structure with a large interlayer distance which can promote the intercalation and deintercalation of lithium and sodium ions. 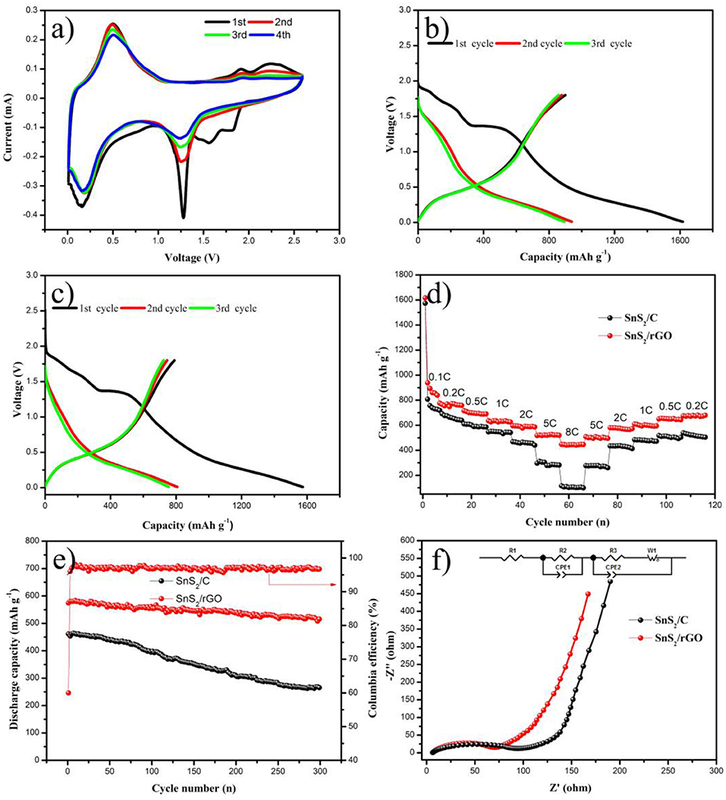 SnS2/C prepared by using polyacrylonitrile as carbon source delivered the capacity of 570 mAh g−1 after 100 cycles at discharge current density of 0.05 A g−1 (Wang et al., 2015b). However, SnS2 electrode still suffers the poor electrochemical performance, such as large cycling capacity loss for its low electronic conductivity. To overcome these problems, graphene was introduced into the anode materials. The graphene can improve the electric conductivity and decrease the volume change during the intercalation and deintercalation process of the lithium and sodium ions. So, the electrochemical performance of the anode material could be improved by reduced graphene oxide (rGO) introduction. Du et al. reported that, after 50 cycles, Co3S4-PNS/graphene sheet electrode still show the discharge capacity of 329 mAh g−1 at 0.5 A g−1 (Du et al., 2015). SnSe2 nanoplate/graphene composite was synthesized by hydrothermal method and showed a better storage performance than that of SnSe2 nanoplates without graphene (Choi et al., 2011). Zhang et al. reported that FeSe2/sulfur-doped rGO sheets displayed the discharge capacities of 383.3 and 277.5 mAh g−1 at high current densities of 2.0 and 5.0 A g−1 (Zhang et al., 2016a). Nanosheet materials could be also prepared by solution combustion synthesis method (Ramkumar and Minakshi, 2015; Ramkumar and Sundaram, 2016). In this work, a novel method was developed to synthesize SnS2/rGO composite anode material for LIBs and SIBs. In this composite, SnS2 grew on the surface of rGO nanosheets, which possessed good electronic conductivity. So, the SnS2/rGO electrode exhibited outstanding lithium and sodium storage properties and cycling performance. The preparation mechanism, as well as the physical and electrochemical properties of SnS2/rGO composite was carefully discussed. Graphene oxide (GO) was dispersed in deionized water, with the concentration of 1.5 mg mL−1. 20 mL ethylene glycol and 30 mL GO solution were introduced into a round-bottom flask. The mixed liquid was ultrasonically treated for 0.5 h. 0.5438 g SnCl4·5H2O dissolved in 10 mL EG was then added into the mixed liquid. After magnetically stirred for 0.5 h, the suspension was heated to 120°C and treated by reflux condensation method for 2 h, and then cooled down to the room temperature. 0.6014 g thioacetamide and the suspension were added to a 100 mL Teflon-lined stainless steel autoclave and then magnetically stirred for 20 min. Then, the autoclave was transferred into an oven and kept at 160°C for 12 h. After cooling down naturally to room temperature, the precipitate was centrifuged, and washed by deionized water and absolute alcohol for several times, and then dried at a 80°C vacuum oven for a whole night. The mixture was sintered at 500°C for 4 h under Ar atmosphere. Finally, SnS2/rGO composite with 15 wt% rGO was obtained. The SnS2/rGO composites with 10 and 20 wt% rGO were also prepared through the same way by adding different contents of GO. For comparison, the SnS2/C composite was synthesized by the same method without using GO, replaced by 1 g glucose as the carbon source added into the suspension together with thioacetamide. 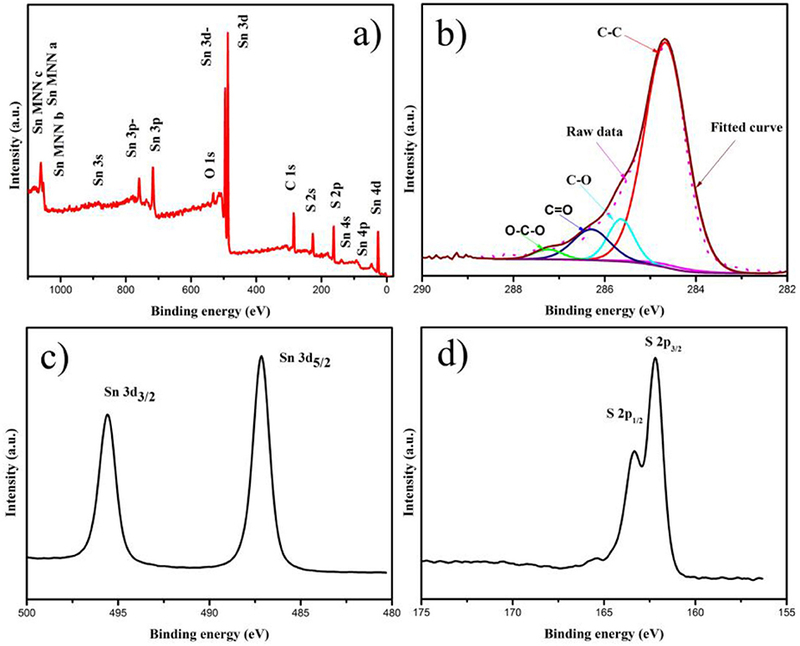 The crystalline phase of SnS2/rGO composite was analyzed by X-ray diffraction (XRD, Rigaku D/Max 200PC, Japan) using Cu Kα radiation. The scanning rate was 5° per minute, and the range of scanning diffraction angle (2θ) was from 10° to 80°. The Raman spectra were conducted by Raman spectroscopy (Lab RAM Aramis, Jobin Yvon, France). The oxidation states of Sn, S, and C elements in the samples were studied by X-ray photoelectron spectroscopy (XPS, PHI5700, USA). The morphologies of the samples were observed by scanning electron microscopy (SEM, FEI, Nova NanoSEM-230, USA), and high resolution transmission electron microscopy (TEM, FEI, Tecnai G2 F20 S-Twin, USA), working at 200 kV. The element contents of the samples were studied by energy dispersive X-ray spectroscopy (EDS). The carbon and sulfur analyzer (CS744, Leco, USA) was applied to quantify the amount of carbon and sulfur in the composite. The SnS2/rGO anode material was evaluated using 2025-type coin cells prepared in a pure argon-filled glove box. The product slurry was prepared by mixing SnS2/rGO powder, carbon black and polyvinylidene fluoride by 8:1:1 in weight, and dispersed in N-methyl pyrrolidinone. The result slurry was pasted onto a Cu foil. After dried, the foil with SnS2/rGO material was cut to a 14 mm diameter disk. The electrolyte for SIBs was 1 M solution of NaClO4 dissolved in ethylene carbon (EC)/dimethyl carbonate (DMC) (weight ratio 1:1) and 5 wt% fluoroethylene carbonate. The electrolyte for LIBs was 1 M solution of LiPF6 in EC-DMC (weight ratio 1:1). The counter electrode for SIBs was a sodium foil and a Whatman GF/D as the separator. And lithium foil counter electrode and Celgard 2500 separator were used in LIBs. Electrochemical tests were conducted on LAND battery cycler by using an automatic galvanostatic charge-discharge unit (LAND CT2001A, China), with the potentials of 0.01–2.50 V vs. Na/Na+ electrode and 0.01-1.80 V vs. Li/Li+ electrode. The cyclic voltammetry (CV) and electrochemical impedance spectroscopy (EIS) measurements were recorded by an electrochemical workstation (CHI660D, CH Instruments, USA). The EIS spectra were recorded by applying an AC voltage of 5 mV amplitude in the frequency of 10−2−105 Hz. The scanning rate of CV was 0.1 mV s−1. SnS2/rGO composite was prepared by reflux condensation and hydrothermal methods. The XRD pattern of SnS2/rGO composite was showed in Figure 1. 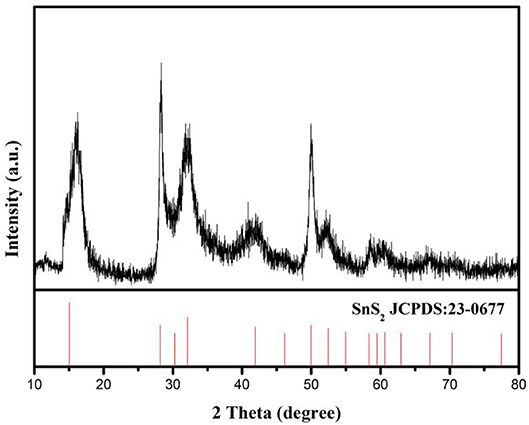 The pattern shows that all the peaks are indexed to SnS2 (JCPDS#23-0677) with 2T-type layered structure. There were no obvious impurity peaks in the XRD pattern, especially at 10.9° which is the location of characteristic peak of GO. It means that there is no impurity in SnS2 sample and GO was reduced to rGO through heat treatment. Figure 1. XRD pattern of SnS2/rGO composite. The SEM images of SnS2/rGO composites with different contents of rGO were shown in Figure 2. The designed contents of rGO in the composites were 10 wt% (Figure 2A), 15 wt% (Figure 2B) and 20 wt% (Figure 2C). In Figure 2A, it can be observed that SnS2 not only grew on rGO nanosheets but also self-assembled as nanoplates. When the rGO content increased to 15 wt%, there were no SnS2 nanoplates observed in Figure 2B and the thickness of SnS2/rGO sheets became thicker than that of rGO sheets (not shown). In Figure 2C, the morphology of the sample seems no obvious difference with that of the sample in Figure 2B. The rGO in the samples can be regarded as a template for the growth of SnS2. SnS2 self-assembled as nanoplates when the content of rGO was not enough. And the SnS2 nanoplates disappeared as the rGO content increased in the composite. The rGO content in the composite (Figure 2C) is excessive, which reduce the volume energy density and raise product cost. So, the optimum content of rGO was 15 wt% among the three samples. The measured content of S element in the composite (Figure 2B) was 29.53 wt%. So, the content of rGO in the composite was calculated as 15.8 wt%, which is close to the designed value of 15 wt%. The properties of SnS2/rGO (15 wt%) composite were further investigated. Figure 2. SEM images of SnS2/rGO composites with different contents of rGO: (A) 10 wt%, (B) 15 wt%, (C) 20 wt%, and (D) 15 wt%; the elemental mappings of (E) Sn, (F) S, and (G) C.
The distributions of Sn, S, and C elements of SnS2/rGO composite were studied by EDS. The EDS mappings further show that SnS2 was distributed homogeneously on rGO nanosheets. The microstructure of SnS2/rGO nanosheets was conducted by TEM, as shown in Figure 3. In Figure 3A, the TEM image shows that SnS2 nanosheets were coated by the plicate graphene nanosheets. The inset figure in Figure 3A shows that SnO2 nanoparticles grew on the GO nanosheets before the hydrothermal synthesis of SnS2/rGO. The SnO2 nanoparticles were about 5–10 nm and coated on the surface of GO nanosheets tightly. Thus, SnS2 nanosheets could in-situ grow on the surface of GO nanosheets. The side view of the SnS2 nanosheets is shown in Figure 3B, and it is seen that the thickness of the nanosheets is about 10 nm. The parallel fringe spacing in Figure 3C was 0.586 nm and the lattice distance in Figure 3D was 0.319 nm, corresponding to (001) plane and (100) plane of SnS2 with 2T-type layered structure, respectively. There is no obvious crack or collapse in SEM and TEM images, which is beneficial for good cycle stability of the composite. Figure 3. (A,B) TEM images and (C,D) HRTEM images of SnS2/rGO composite; the insert in (A) is the TEM image of SnO2/GO composite. The XPS analysis was applied to investigate the electronic states of Sn, S, and C elements in SnS2/rGO composite, as shown in Figure 4. The Sn 3d, C 1s and S 2p peaks can be observed clearly in Figure 4A. In Figure 4B, the C 1s peak was resolved into four parts. The peaks centered at 284.6, 285.6, 286.3, and 287.3 eV correspond to C-C, C-O, C = O and O-C = O type bonds, respectively (Qu et al., 2014; Zhang et al., 2014; Fang et al., 2016). In Figure 4C, the high-resolution Sn 3d spectrum exhibited two signals at 487.2 and 495.6 eV for Sn 3d3/2 and Sn 3d5/2, respectively, corresponding to Sn4+. In Figure 4D, the presence of SnS2 can be confirmed by S 2p peak at 163.4 and 162.3 eV (Zhang et al., 2015b). Figure 4. (A) XPS spectrum of SnS2/rGO composite; the high-resolution XPS spectra of (B) C 1 s, (C) Sn 3d, and (D) S 2p. The electrochemical performances of the samples were investigated by coin cells. Figure 5 shows the lithium storage, rate and cycling properties. The CV test of SnS2/rGO electrode was conducted in the voltage of 0.01–2.6 V. The alloying and dealloying reactions happened between Li and SnS2, as described in Equations (1) and (2) (Zhai et al., 2011). In the first cycle of cathodic scans, LixSnS2 formed at 1.8 V by the lithium intercalation into SnS2 layers. Two broader peaks were present at about 1.3 and 0.12 V. The peak at about 1.3 V corresponds to the decomposition of the SnS2 into metal Sn and Li2S. The peak at about 0.12 V is ascribed to the formation of LixSn by lithium and metal Sn (Zhai et al., 2011; Zhang et al., 2014). The peaks in 1.8-2.6 V correspond to the formation of SnS2. In the anodic scans, the peaks appeared at around 0.5 V are mainly related to the dealloying of LixSn. Figures 5B,C show the typical charge and discharge profiles of SnS2/rGO and SnS2/C electrodes at 600 mA g−1, respectively. The charge and discharge voltage was between 0.01 and 1.8 V. The SnS2/C electrode exhibited initial discharge and charge capacity 1574 and 790.1 mAh g−1, with a coulombic efficiency of 50.2%. However, SnS2/rGO electrode delivered higher discharge and charge capacity of 1616.6 and 899.6 mAh g−1, with higher initial coulombic efficiency of 55.6% compared with that of SnS2/C electrode (50.2%). Rate capability is highly crucial for anode materials in LIBs, and the rate performances of the samples are shown in Figure 5D. SnS2/rGO electrode exhibited outstanding rate performance compared with that of SnS2/C electrode. SnS2/rGO electrode showed high discharge capacities of 776, 715, 635.6, 595.2, 517.5 and 447.1 mAh g−1 at 0.2, 0.5, 1, 2, 5 and 8 C, respectively. 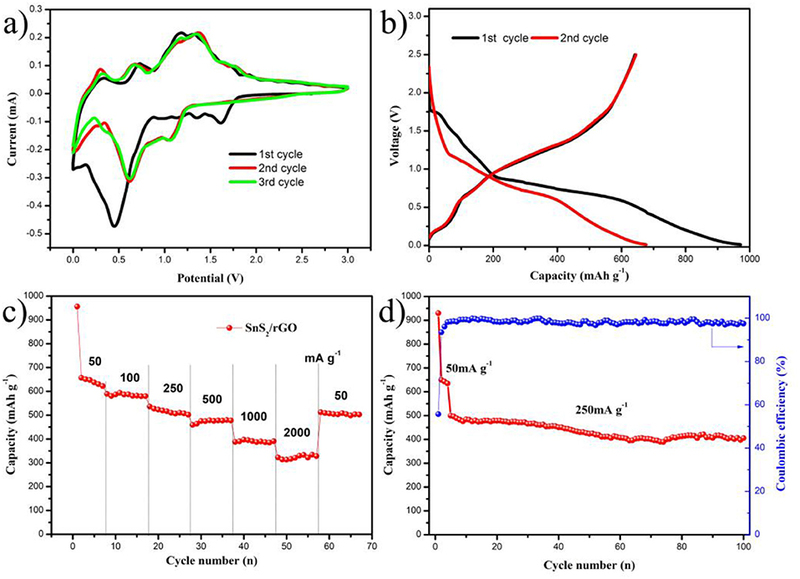 After cycling at different current densities, SnS2/rGO electrode delivered 675 mAh g−1 at 0.2 C. However, SnS2/C composite as a contrastive electrode showed worse rate performance, achieving the discharge capacities of 718.2, 609.7, 546.7, 467.7, 297 and 116 mAh g−1 at 0.2, 0.5, 1, 2, 5 and 8 C, respectively. Figure 5E shows the cycling properties of SnS2/C and SnS2/rGO electrodes at 1.2 A g−1. Obviously, for SnS2/rGO electrode, a higher discharge capacity of 514 mAh g−1 can be obtained after 300 cycles. Compared with SnS2/rGO electrode, the SnS2/C electrode showed a worse cycle performance. The cycle performance of SnS2/rGO electrode in this work and other literatures were summarized in Table 1. It is found that SnS2/rGO electrode in this work exhibited an excellent cycle performance. Figure 5. Electrochemical performances of SnS2/rGO and SnS2/C electrodes in LIBs: (A) CV curves of SnS2/rGO electrode; charge and discharge curves of (B) SnS2/rGO and (C) SnS2/C electrodes; (D) rate and (E) cycle performances of the electrodes; (F) Nyquist plots of the electrodes; the inset is the equivalent circuit for EIS results fitting. Table 1. Rate performances of SnS2/rGO electrodes in this work and the other literatures. To further understand the reason for the improvement of electrochemical properties of SnS2/rGO electrode, the EIS of which was measured. Figure 5F displays the Nyquist plots of SnS2/rGO and SnS2/C electrodes. The curves exhibited similar shapes, including a semicircle and a straight line in the high frequency region and the low frequency region, respectively. The inset figure of Figure 5F is an equivalent circuit model, which is the fitting result of the Nyquist plots. R1 is the ohmic resistance of the electrolyte and electrode; Rct is the charge transfer resistance, the value of which is the sum of R2 and R3; Zω is the Warburg impedance; CPE represents the double layer capacitance and passivation film capacitance (Zhang et al., 2017b; Tong et al., 2018). R1 of SnS2/rGO and SnS2/C electrodes was 6.4 and 6.2 Ω, respectively; Rct of SnS2/rGO was 79.7 Ω, which is much smaller than that of the SnS2/C electrode (105.2 Ω). The decrease of Rct in SnS2/rGO electrode implies that the charge transfer process was successfully facilitated by rGO nanosheet introduction (Xu et al., 2016b). The sodium energy storage performance was also investigated and shown in Figure 6. The CV for the first three cycles of SnS2/rGO electrode was shown in Figure 6A, which was tested between 0.01 and 3.00 V. The electrochemical reactions described in Equations (3) and (4) (Zhang et al., 2015c). The peak at about 1.6 V corresponds to the intercalation of sodium into SnS2 layers and the formation of NaxSnS2 during the first cathodic scan (Qu et al., 2014; Wang et al., 2015b; Chao et al., 2016). The peak at about 0.45 V is ascribed to the conversion and alloying reactions. And the peak was shifted to about 0.6 V in the second and third cycles. It is due to the formation of solid electrolyte interface (SEI) film. In the anodic scans, there were three peaks at about 0.3, 0.75, and 1.3 V, which correspond to the formation of metal Sn, NaxSnS2, and SnS2, respectively. The second and the third cycles were almost the same, which suggests that SnS2/rGO electrode possesses a good reversibility during the sodiation and desodiation process. The charge and discharge curves are shown in Figure 6B. The charge and discharge tests were carried out at the current density of 50 mA g−1. In the initial discharge process, a short plateau appeared about 1.7 V, which corresponds to the formation of NaxSnS2 by sodiation into SnS2 layers. A tilted plateau from 0.8 to 0.6 V corresponds to the sodiation of more sodium ions into NaxSnS2, and the formation of metal Sn and Na2S. During this process, SEI film was formed at the same time (Luo et al., 2012). In the plateau below 0.6 V, a reaction occurred between metal Sn and sodium ions to form NaxSn (in theory the x is less than 3.75). The discharge and charge capacities of the first cycle were 960.0 and 641.8 mAh g−1, respectively. The irreversible capacity loss of the first cycle was 318.2 mAh g−1, which is usually caused by the formation of SEI film. The charge and discharge curves of the second cycle were also shown in Figure 6B. The charge and discharge capacities in the second cycle were 645 and 677.1 mAh g−1, respectively. The charge curves in the first and second cycles almost overlapped, suggesting that the SnS2/rGO anode has a good electrochemical reversibility. The details of rate performance are shown in Figure 6C. SnS2/rGO electrode showed the discharge capacities of 645, 586, 536, 462, 387 and 320 mAh g−1 at 0.05, 0.1, 0.25, 0.5, 1.0 and 2.0 A g−1, respectively. The cycle performance was also investigated, as shown in Figure 6D. The electrode in the first four cycles was discharged and charged at 0.05 A g−1, and then at 0.25 A g−1. The capacity was 405 mAh g−1 after 100 cycles, and the capacity loss was 18.8%. Meanwhile, the coulombic efficiency was stable at about 99% for a long time after the first few cycles. Figure 6. Electrochemical performance of SnS2/rGO electrode in SIBs: (A) CV curves of the electrode; (B) charge and discharge curves of the electrode; (C) rate and (D) cycle performances of the electrode. 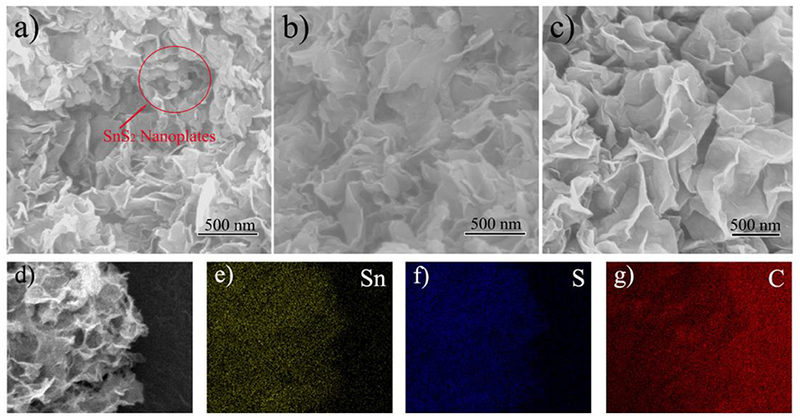 In summary, SnS2/rGO nanosheet composite was synthesized by reflux condensation and hydrothermal methods. SnS2/rGO composite as an anode material showed excellent electrochemical properties for both LIBs and SIBs. The excellent sodium storage performance of the SnS2/rGO composite could be attributed to the following reasons. The nanosheet structure of SnS2 can shorten the diffusion path of lithium and sodium ions. Furthermore, rGO can enhance the electronic conductivity of the composite. Therefore, the SnS2/rGO composite could be considered as a promising anode material for LIBs and SIBs. HC carried out the experiment and wrote the manuscript. HL, LM, DB, and SC participated in the experiment. BZ, JZ, WY, JZ, and ZD contributed to the discussion. HT supervised the experiment and proofread the manuscript. This work was supported by National Natural Science Foundation of China (Grant No. 51502350, 51702367 and 51772334), China Postdoctoral Science Foundation (Grant No. 2016M592447), and The International Postdoctoral Exchange Fellowship Program (Grant No. 155212). Copyright © 2018 Chen, Zhang, Zhang, Yu, Zheng, Ding, Li, Ming, Bengono, Chen and Tong. This is an open-access article distributed under the terms of the Creative Commons Attribution License (CC BY). The use, distribution or reproduction in other forums is permitted, provided the original author(s) and the copyright owner(s) are credited and that the original publication in this journal is cited, in accordance with accepted academic practice. No use, distribution or reproduction is permitted which does not comply with these terms.